Building high quality separated cycle paths isn’t possible. Belfast’s roads are too narrow. This is one of the many default arguments against investing in the type of cycling infrastructure seen in the Netherlands or Copenhagen. Sometimes it’s worth looking at the urban landscape from a different perspective..
A quick whizz through the @nigreenways highlights of the year..
2013 began with a bang in Belfast – remember flegs? – and NI Greenways couldn’t resist getting in on the rush hour hysteria. Amid the rumours of roads being blocked and large roving protests popping up to cause maximum traffic disruption, canny commuter cyclists still had time to observe normal city life; and this commuter caused a mini panic among office workers at 5pm on a Friday night.. The Department for Regional Development are about to deliver another quiet kick in the teeth to cyclists in Belfast, by rolling back a new bus lane in order to reward bad driving. East Bridge Street is one of the top two roads for cycling traffic in Northern Ireland, with the Albert Bridge acting as a funnel for most citybound journeys from East Belfast. It already suffers from the dangerous Albert Bridge itself dissuading cyclists, illegal taxi parking in a bus lane, and a dangerous junction caused by drivers queue-jumping and fancying a late swerve onto Cromac Street. The rise of cycling in Belfast is a welcome sign of public understanding of the flexibility and reliability of the bicycle. But scratch beneath the surface and the classic signs of a poor city environment for cycling are clear. Riding a bike is a non-exclusive activity, open and beneficial to everyone. 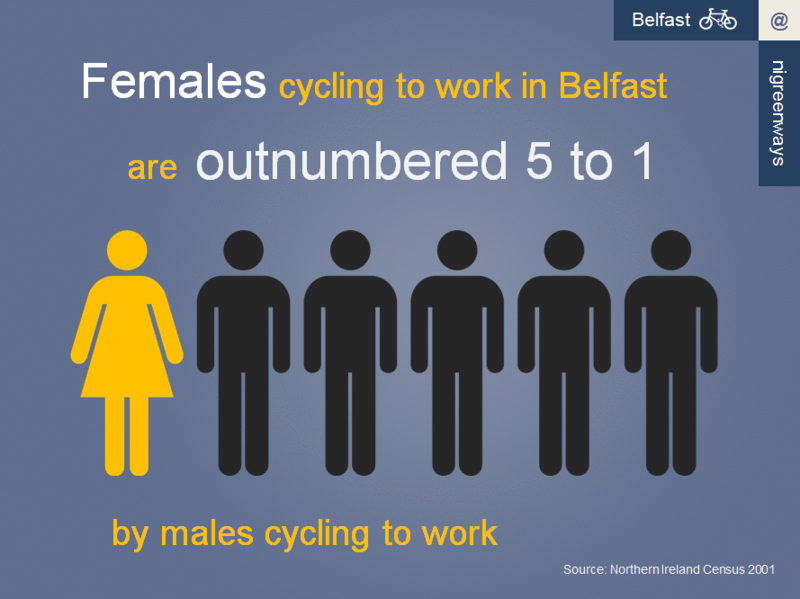 But Belfast commuter cycling appears to be male-dominated, judging by numbers seen riding each day. What is the reality? Part one of Socio-economics of Belfast commuter cycling looked at deprivation indicators to trace the economic fault lines in Belfast cycling. The second part Socio-economics of Belfast commuter cycling // Gender gives a quick overview of a shocking imbalance in Belfast. Just one out of every six commuter cyclists is female. Where is our Gasworks Bridge? Belfast is in the middle of a mini active travel boom, mainly driven by rising numbers of bike commuters. But Belfast suffers from structural issues which hold back cycling development, not least the physical barrier of the River Lagan. One plan to provide relief, a new pedestrian and cycling bridge linking the Gasworks site to Ormeau Park, has been largely forgotten. Why? 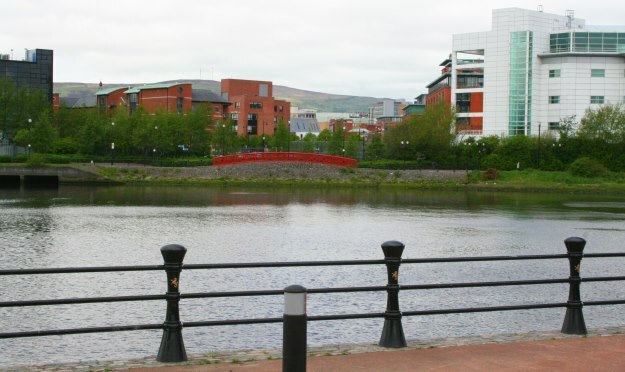 This would be the first standalone bridge to be built in Belfast solely for cycling and walking journeys – an important signal of intention to follow through on active travel promotion. Local residents surveys have always returned positive views, with few concerns about potential interface issues. All very positive, but it seems to have dropped off the agenda. The spine of the National Cycle Network runs along the western bank of the River Lagan here, connecting a traffic-free route stretching from Lisburn to Newtownabbey, a developing connection to the Comber Greenway (and the Connswater Greenway project) and hopefully all the way to Bangor in the future. The embankment cycle tracks and shared pathways have contributed to an upsurge in active travel, with cycling flow increases of over 250% observed between 2000-2010 (PDF, 499k). Adding the bridge would open up east-west journeys on the National Cycle Network, increasing the potential of the Gasworks Park pathway which links almost directly into the city centre. The Gasworks Park hosts large employers like Lloyds and the Northern Ireland Environment Agency, but also the Radisson SAS Hotel. The bridge would not only be a commuter and lunchtime leisure option, but also a tourist facility. For walking journeys to work, Shaftesbury and Botanic wards lead the way with over 40% of commuter ‘traffic’ on foot. Yet just across the river there is a sharp drop-off with Woodstock and Ballynafeigh wards around 25% and Ravenhill less than 20%. Physical disconnection is at least partly responsible, with long diversions needed to reach the main employment base in the city centre. The communities surrounding Ormeau Park are also at the forefront of the the current cycling boom. While still quite low levels compared to proper cycling cities around the world, nonetheless Woodstock, Ravenhill and Ballynafeigh are the top 3 wards in the whole of Northern Ireland by cycling commuter share at 5-6%. A startling 51% of households in Woodstock have no access to a car or van (Census 2011) over double the rate of Northern Ireland as a whole. Direct traffic-free access into the city centre is both desirable and necessary here. Belfast has seen a 60% rise in cycling commuters between 2001 and 2011. If a Gasworks Bridge contributed to a doubling of cycling levels in these top 3 wards by 2021, cycling levels would outstrip even bus commuting here, which begins to fundamentally change the inner city transport dynamics. By upgrading cycling routes beyond Ormeau Park, across traffic-calmed residential streets towards Cregagh and Castlereagh Roads and the two Greenways, a genuine and attractive alternative to car travel becomes possible for a large part of South East Belfast. A positive impact on inner city traffic levels must be considered a key element of the bridge’s benefit. What are the alternative cycling commuter routes? The existing connections between the city centre and the suburbs of South and East Belfast have become scenes of cycling commuter stress and conflict. The area is poorly served by just two main access points across the Lagan a mile apart, the Ormeau Bridge and the Albert Bridge. The Albert Bridge is awful for cycling, with it’s narrow road space, ugly crash barriers and no safe cycle space. Roads Service estimates 50% of cyclists use the narrow footpaths rather than the road. Yet as a listed bridge (built in 1890) the options for change are apparently limited. The Ormeau Bridge has a more open feel, but again has no dedicated cycling space. The ghost bike memorial for Michael Caulfield is a stark reminder of how dangerous our roads are for cycling – more so as the Ormeau bridge and embankment intersection is probably the busiest area in Northern Ireland for commuter cycling. Why has the project faltered before? Planners have had their eye on a bridge here for decades, but not always for a footbridge. In the rush to build for a motorised future, 1960s plans foresaw an urban motorway running around the Gasworks site and over to Ravenhill. While the motorway plan thankfully fell away in the 70’s, the idea of a more modest distributor road bridging the Lagan and running to the Ravenhill Road lingered through to the 1990s. Along with the main plan for a southern inner ring road, currently in limbo, this has contributed to urban blight through restricted development along the Bankmore corridor. Lots of interested parties, but no-one to take a clear lead. It was unfortunate timing that the Laganside Corporation was wound up within 2 years of this, having reached £1 billion of investment in the city. The last major push was around 2009, with talk of the project even being linked to the failed national stadium bid at Ormeau Park. An application for Special EU Programmes Body (SEUPB) Peace III funding “fell down on its demonstration of peace and reconciliation outcomes and its ability to provide a lasting legacy to the peace programme”. The project’s most important function is to provide a new transport corridor in Belfast. Can DRD to demonstrate they have moved beyond this point, and take ownership of a major project exclusively for active travel? Is there a golden window of opportunity given the ongoing difficulties with the A5 road project? The recently opened Peace Bridge in Derry~Londonderry is a fantastic local example of what can be achieved for urban cycling and walking transport. Around 2,300 people use the bridge every day, and is a challenge to Belfast to replicate or exceed this impressive performance. For an international comparison, Copenhagen is one of the leading cities in the world for urban cycling, with a journey share of around 36%. But it’s a city still trying striving to improve, and leading this charge with urban bridge building for non-motorised traffic with the Copenhagen harbour bridges project. The Gasworks Bridge is a key element of re-imagining and reworking central Belfast. Council plans are afoot for sweeping regeneration from the Markets area to Sandy Row and Shaftesbury Square. The bridge would open up new possibilities for commuting, leisure, shopping and social trips that aren’t really viable today. It’s easy to overplay the significance, but the bridge even has the potential to help boost the evening economy in the city. The Gasworks Bridge is a key part of the Belfast Metropolitan Transport Plan 2015, which is still used to determine capital project priority in the current budget period. If the DRD Minister should wish to leave a legacy for Belfast which provides positive encouragement to reduce car journeys, he would struggle to find a better opportunity than the Gasworks Bridge. What do you think about the idea of a Gasworks Bridge? Will it encourage you to ditch the car? Comments are open below..
A week is a long time in politics, and one week on from this post there is stunning news. Regional Development Minister Danny Kennedy, while addressing the Politically Painless Active Travel conference in Belfast, announced he is to commission a feasibility study into the Gasworks Bridge project! This is great news for the local community, active travel organisations, councillors and many others who have put in the real work over a decade to see this bridge built. Hopefully DRD / Roads Service will make swift progress, and the project’s overwhelming benefits will ensure a positive outcome. The potential to transform this part of Belfast is immense – with Belfast cycling on the rise, it seems the Gasworks Bridge’s time has come! Is the Belfast bin lane haunted? 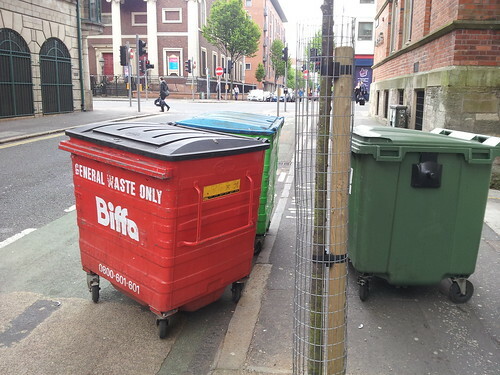 Recently, the Belfast bin lane (cycle lane on Upper Arthur Street) has seen the return of the red Biffa bin. Following contact with the company last September, partial success has been observed – it’s mostly been the Aisling award winning Wastebeater bins blocking the cycle lane of late. 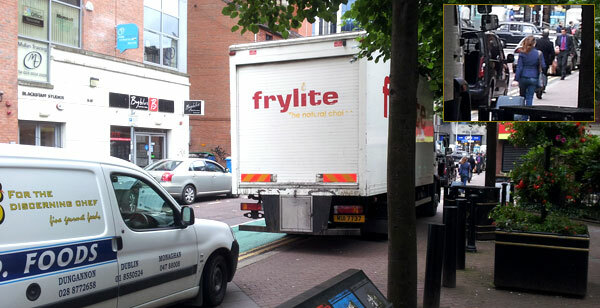 Biffa’s explanation this time is that neither Biffa nor their client businesses are responsible for blocking the cycle lane. A mysterious unseen force is at work! Sensing Biffa trying to cover their behinds in the face of evidence showing blatant obstructions, NI Greenways allows poor Biffa enough rope to hang themselves.. According to our Traffic Dispatcher at the depot, he has spoken with the driver who does this round. The driver has assured us that when he gets to the bin it is already in the cycle lane and after he empties it he sets it back against the wall. This afternoon our depot spoke to the manager of the Basement bar and explained the situation, he has told us that they always leave the bin up against the wall when they put it out in the morning. Given that both the manager of the bar and our driver are both insisting that they leave the bin against the wall, it must be being moved by a third party. If we could obtain CCTV we’d know for certain. Unfortunately, all we can do for now is move the bin back every time we discover it relocated. Happy to work with you if you have any other suggestions. Really appreciate you getting back so quickly. Can I clarify exactly what you’re saying in your email, perhaps easiest if we refer to the attached picture? 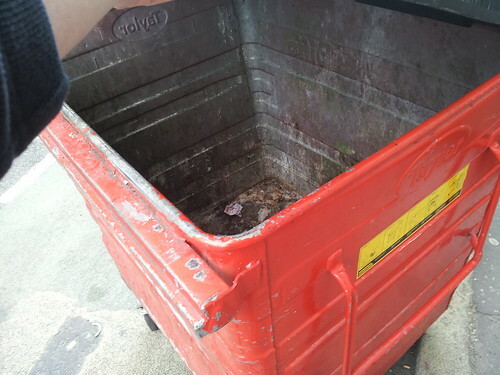 The Basement staff and Biffa staff are leaving the red Biffa bin by the wall (marked GOOD) but some unknown third party is moving them to the cycle lane (marked BAD, Wastebeater bin as example). Is this correct? This appears to be the case. As I said, we are happy to work with you on a solution, if one can be found. So, whether or not some pesky unseen hand is taking the Biffa bin into the cycle lane, you’ve been very clear that both Basement staff and Biffa staff are placing the bin in a position which restricts pedestrian use of the footpath. If this is reported to Roads Service, the bin could be removed. This could leave the Basement liable to a return fee, and could jeopardise your client relationship. Never mind the grubby corporate image for Biffa of a branded bin blocking a city centre footpath/cycle lane and causing great inconvenience for wheelchair users among others. Many thanks for your suggestion. I’ll speak to the depot and find out whether this is possible. 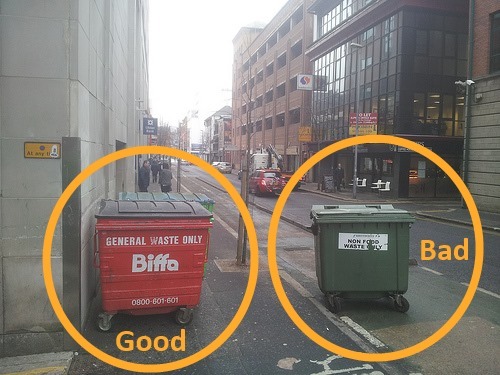 I imagine from our point of view, it makes no difference if the bin is located in the alleyway. However, I’m based in Birmingham and not familiar with this area. By leaving the bin in the alleyway it may be obstructing delivery/emergency vehicles or there may be some other reason. I’ll check with the depot and let you know. I’ve spoken to the depot. They will ask the driver to pull the bin the 100 yards up the alley way back to the basement bar after it has been emptied. If its left in the entry to the alley way it’ll block access to a garage, which may explain the third party issue. Hopefully this will resolve the issue. Give credit to Biffa for another speedy response and, at the point of complaint, a willingness to engage. Also thanks to DRD, who are keen to hear about bins blocking this cycle lane, and will happily remove offending items if reported. The entry only being 30 yards long isn’t quite the chore it’s made out to be (and yes, even Google Maps Streetview loves a bit of bin lane blocking #facepalm). It’s also a daft suggestion that a bin set against a wall on a footpath would be moved by a car driver trying to get down the alleyway, but then the bin lane does have it’s own special rules and perhaps laws of physics, so anything’s possible. Whether the spooky third party movement excuse was a spectacular porky or not, at least it cleared up that Biffa bins shouldn’t be blocking the pavement or the cycle lane. And they won’t be in the future. Will they? Oh Biffa..
Is it still the bin lane or is it the Ulster Bank delivery lane? Recently a group of 16 cyclists from Belfast showed that the city’s cycle ‘network’ is effectively a car park. Over 5 days they encountered 878 illegally parked vehicles blocking their commuting journeys. That was an illegally parked car blocking a cycle lane every 250m. This was raised with the Department for Regional Development, the Stormont Regional Development Committee and Belfast MLAs and Councillors. We are acting upon this information by doing nothing different. DRD makes a big deal of it’s online and telephone contact points to report issues as they happen, but when faced with criticism of their system of enforcement, they’re unwilling to engage. Sitting 6 months down the line and very little has changed; night after night the same problems occur. The circumstances may be slightly different, but look 100 miles down the road to the Dublin City Council Beta Projects and despair that DRD can’t be more open to this kind of innovative public engagement. Does DRD recognise there is a particular issue of importance being raised here? Does DRD feel it is acceptable for the level of illegal blocking of cycle lanes to be happening under its watch? What is the typical number of NSL staff deployed to patrol the city centre parking zone each weekday (09.00-18.00)? By comparison what is the typical number of NSL staff deployed on arterial routes each weekday evening during urban clearway operation (16.30-18.00)? How does DRD/NSL track the operational coverage of wardens on arterial routes? How are the effectiveness of the new scooter wardens / clamp and tow truck assessed? What are the performance measures for NSL? What is being done to address the ‘hot spots’ identified in the 2 surveys, for example Shankill, Springfield, Castlereagh, Cregagh and Crumlin roads? What further engagement with local businesses on arterial urban clearway routes has happened / is planned since the Parking Do’s and Don’ts leaflet? Although no-one’s betting the house on that meeting happening.. The Reclaim Belfast’s Cycle Lanes team and a growing number of local cyclists are not championing on-road advisory cycle lanes – in fact they are increasingly recognised as outdated, unsafe, and do nothing to encourage more people to cycle. Indeed the urban clearways rules, as referenced in DRD’s letter, mean it’s perfectly fine to block a cycle lane for 2 minutes at a time to set down / pick up passengers. These may be cycle lanes by name, but they are crafted around the needs of motor vehicles and cyclists are not the most important users. However, until DRD open their eyes to best practice from the Netherlands, Copenhagen and others, it’s practically all we have. If DRD want to crow about their £9 million investment in Belfast cycling infrastructure, then along with Roads Service and NSL they have a responsibility to keep the lanes clear when they’re meant to carry cyclists. No-one is prepared to admit the problem, so no-one is taking responsibility to sort it out. Thank you for your recent email about illegal parking in cycle lanes in Belfast during morning and evening clearway periods. As you will be aware, NSL provides parking enforcement on behalf of Roads Service and routinely deploys Traffic Attendants to patrol the main arterial routes in Belfast during the morning and evening clearway periods. Traffic Attendants will take enforcement action if they detect vehicles parked in contravention of enforceable restrictions. Roads Service’s records for Belfast show that in 2012, during clearway periods, 5528 Penalty Charge Notices (Parking Tickets) were issued to vehicles parked on the carriageway and a further 363 to vehicles parked on the footway. It is not possible to separate Parking Tickets issued to vehicles parked in cycle lanes as they would be issued for the clearway contravention. During clearway periods vehicles are permitted to set down and pick up passengers, however they cannot simply park. If a vehicle is detected by a Traffic Attendant as parked during clearway times and the driver is in the vehicle they will be afforded the opportunity to drive away and park legally elsewhere, however, unattended vehicles should be issued with a Parking Ticket. During clearway periods it can be difficult for Traffic Attendants to deal with short term parking as vehicles often park for a few minutes only, or they may drive away before a Parking Ticket is issued, or the Traffic Attendant may be patrolling another location when these vehicles park. The development of a Parking Enforcement Protocol, which provides the public with detailed information on all the parking contraventions, including bus lanes, cycle lanes and clearways, this is available on NI Direct website: Travel, transport and Roads / Parking and parking enforcement section. The Introduction of scooters specifically for clearway enforcement patrols. These provide greater flexibility, can cover greater distances and should provide more effective enforcement. Roads Service does respond to requests for additional enforcement, subject to resources, if there are locations where there is persistent parking during clearway periods. Following your e-mail NSL has been directed to continue to take enforcement action as necessary on their routine patrols during clearway periods. I trust this information is of assistance to you. What value in the perception of cycling safety? Regional Development Minister Danny Kennedy is in the final stages of considering whether to allow all taxis into bus lanes in Northern Ireland. What appeared just weeks ago to be a done deal in favour of the taxi lobby, has been thrown into the mix again by vocal opposition from ordinary commuters in Belfast. But are Departmental officials giving enough weight to the perception of safety among current cyclists, and crucially the thousands of people Belfast needs to convince to switch to the bike? The case presented by the Department for Regional Development (DRD) for allowing all taxis into bus lanes is fundamentally weak. Private taxi firms are the only group lobbying for the proposal, and no compelling argument has been brought in favour. It remains the ‘easy’ solution for DRD’s dilemma posed by DOE taxi reform, yet transforms and exaggerates a small scale inconvenience for taxi drivers into a major worry for (current and potential) cyclists in bus lanes. Taxis want access to bus lanes simply to speed past rush hour traffic – this is clear and obvious. Yet this clashes with both the requirement for an efficient, reliable and attractive bus service (DRD admit bus journey times will be slowed) and the view among cyclists that 2,000+ taxis threatens the sense and reality of safety and security on their journey. Cyclists launched a campaign against the plan with a City Hall protest and a petition, handed in to the Minister on 13th March. Among the 500+ signatories, many added personal comments to the petition – 76% quoted “safety of bus lanes” as their major concern, effectively a ‘subjective‘ view that private taxis will lessen safety. Views on this ranged from individuals reconsidering their own journey choice to the common belief that it will damage cycling across the city. In one sense DRD have done their job correctly here – measuring objective safety and declaring that bus lanes are demonstrably safe spaces for cyclists. But DRD have told us what we already know, and why we’re trying to retain this ‘safer’ network. Not particularly enlightening. On the other hand, the flawed logic could be compared to a farmer who protects his hen house with a wire fence and strong lock at night. With no evidence or experience of attacks on hens, he takes it as proof that allowing foxes into the coop shouldn’t be detrimental to the safety of hens. There are moves to add perception of risk and safety to transport planning in other areas, notably by the Department for Transport in Whitehall. But it seems policy makers in Northern Ireland have little to go on other than collision stats. The situation is quite different in countries where cycling as transport is valued. Traffic safety has been greatly improved over the past few years. Statistically, the risk of being involved in a serious accident has fallen by 72% per cycled kilometre since 1996. Copenhageners’ sense of security in the traffic has also improved of late. If this sense of security is to rise even further among current cyclists and potential cyclists alike, the most important areas of focus are creating more space on the cycle tracks, making intersections safer and using behavioural campaigns to improve consideration in traffic – including on the cycle tracks. The general traffic safety efforts are also very important. For example, reducing speed limits for cars where necessary. If the objective is the reduction of the number of road casualties, then improving subjective safety in traffic is hardly important. If the objective is to use feelings of being unsafe as an indicator for possible dormant road safety hazards, it is important to assess the validity of these complaints and signals. If the objective is to make people feel at ease in their living environment, and to prevent them from feeling that their own mobility or that of others is impeded by feelings of being unsafe in traffic, then improving subjective safety is important. Should DRD be using an ‘objective’ measure to dismiss a ‘subjective’ fear, especially one which has great potential to limit personal choices? If the third goal listed above extends to the desire for adding more cyclists to the transport mix in Belfast, then DRD are duty bound to research, evaluate and seek to improve subjective safety of cycling, something worryingly absent from the consultation and the rush to bow to taxi firms’ wishes. And in reality, it’s not as if DRD are lacking for evidence of a problem here. The PARC study linked to the ongoing development of the Connswater Community Greenway found that 60% of people felt roads were too dangerous for cycling, and this in an area of Belfast with some of the highest concentrations of commuter cyclists. Similar findings are available from just down the road in Dublin (report) in a city where for years all taxis have been allowed in bus lanes, or ‘pipes of steel’ as many cyclists would refer to them. But then judging by the preceding sentence, the BMTP is a wacky tome, from which planners can pick and choose as they desire (see: the largely forgotten Gasworks Bridge). It’s fair to assume most people who signed the taxis in bus lanes petition cycle regularly on roads, and the message from those who added comments was clear. 76% of people specifically mentioned bus lanes as being valuable safe space for cycling. 25% believed taxis are a uniquely dangerous form of transport, 20% were convinced the plan runs contrary to DRD policies to promote sustainable transport, and interestingly 6% of people indicated that giving up cycling as a result of this plan was a serious option. We’re making a clear point, but is anyone listening? This is exactly the type of reckless attitude that has brought us to this point of protest. Most Belfast bus lanes are at most 3 metres wide. There just isn’t the required safe clearance for a saloon car to pass a cyclist within the boundaries of a bus lane with traffic to the right. This is the type of impatient manoeuvre we so fear, and Fonacab are clearly chomping at the bit to let their drivers engage in. It’s so worrying that a ‘professional road user’ running a taxi firm would have so loose a grasp of Rule 163 of the Highway Code. There is also the troubling issue of relying on collision figures as a true measure of objective road safety. Our friends from Cyclist.ie pointed to a startling piece of research was commissioned in Ireland to attempt to inform road safety policy with an idea of the under-reporting of RTCs. The report showed that the Road Safety Authority’s collision figures were grossly out of step with the numbers of people actually admitted to and discharged from hospital as a result of a RTC – which was 3.5 times greater. However, when it came to cyclists, over the five year period from 2005-09 the RSA reported 109 seriously injured cyclists on Ireland’s roads. The number of hospital discharges for cyclists involved in a RTC in the same period was 1,050: “The difference in numbers is almost ten-fold“. This is truly shocking. This struck me on a personal level. I was knocked down just over two years ago, by a vehicle using an operational bus lane illegally. I didn’t require hospital treatment, but at the same time I didn’t report the issue to the PSNI either. Another unreported collision, among how many every year in Northern Ireland? Cycling in Northern Ireland becoming more dangerous? Undeniably cycling is becoming more dangerous here, even before allowing taxis in bus lanes. Between 2004 and 2011 road safety has improved in Northern Ireland. However the rate of cyclists killed or seriously injured showed a sharp increase in 2010-11. Broadening it out to include minor casualties as well, the trend is upwards for cycling against a downward trend generally. There’s little indication DRD have even recognised this as a particular developing problem, judging by the rush to place thousands of cyclists into conflict with thousands of taxis on tight bus lanes during the busiest periods on our roads. 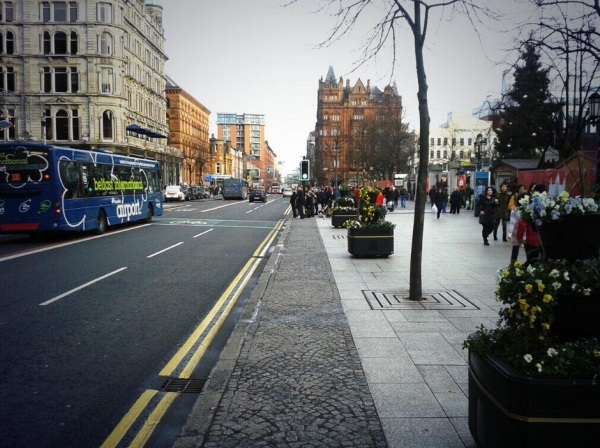 How crucial are bus lanes to cycling in Belfast at present? DRD development of the Belfast arterial road network has produced a repeating pattern – citybound bus lanes for the morning commute, advisory cycle lanes mainly on the countrybound evening side, with some bus lanes substituting. According to DRD there is just 1.32 miles of segregated cycle tracks in Belfast, with many more areas shared with pedestrians, to varying degrees of usefulness/convenience/safety. But the 48km of bus lanes constitutes a vast swathe of Belfast’s commuter cycling space, especially in the highly congested morning rush. Ignoring subjective safety concerns of existing cyclists will tip the balance of risk and reward in the favour of more private car travel, and all the problems that will bring for Belfast as a city trying to keep pace with modern development – while London’s vision puts us to shame. Ultimately this comes down to instinct. Those of us who currently use a bike on the road make our choice based on the balance of risk and reward for cycling in rush hour, and safer spaces have been demonstrated to make a difference even in Belfast, with rises of over 200% in a decade in some areas. Belfast is still in a period of cycling growth, but there’s no guarantee this will continue without investment in safer infrastructure and signalling to non-cyclists that safety concerns are being factored into transport planning. The gut feeling that roads are not a safe place to be on a bike clearly holds so many people back from cycling, male or female, young or old, rich or poor. It’s not all bad news from DRD; this is the department which is radically altering Belfast city centre with the goal of improving sustainable transport. And they’re providing the kick start funding for Belfast Bike Hire, which has the potential to transform the city in the long run. 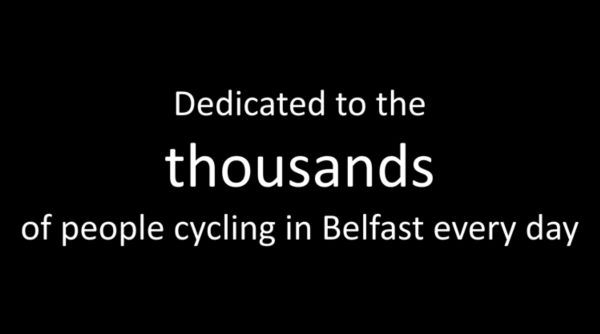 But for that to be a success will require many thousands of people, many who have never cycled before, to feel safe enough to pedal the roads of Belfast. If it doesn’t feel safe, it just won’t be attractive. We are fighting to hold back the tide, with bus lanes rightly valued as some of the safest road space we have. Our low levels of cycling will tell you that bus lanes alone are not the answer, and many people simply will not cycle in traffic at all due to fear. But if we value the rises in cycling seen recently, how can we expect to build upon it when the little safe space we have is being taken away and turned into taxi expressways? Belfast cyclists have again demonstrated that illegal parking on cycle lanes is creating danger on our roads and wasting public money. 16 volunteers – ordinary everyday people getting to work – logged 143 journeys over 5 days in November 2012, encountering 878 illegally parked vehicles along the way. The Reclaim Belfast’s Cycle Lanes 2 survey shows that a typical cycling trip has an illegally parked vehicle blocking every 5 minutes or 3 times per journey. But what concerns cyclists most, and remains ignored by DRD, is that Belfast’s rush hour cycle lanes are blocked every 250 metres by an illegally parked vehicle. A new Belfast record was set on the Shankill Road with 53 illegally parked cars blocking the cycle lane on one trip. The survey shows once more the useless nature of advisory cycle lanes, legally unenforceable except during urban clearway times. DRD compromise this ‘cycling’ infrastructure from the start to allow parking outside rush hour, but fail to make them available to cyclists during rush hour. The outcome of the first survey in July 2012 was largely ignored. DRD promises of reviewed parking enforcement making a difference have not borne fruit. Belfast commuter cycling grew 60% in the decade to 2011; there are thousands of cyclists on the city’s roads every day. Belfast is in the top 10 UK cities for cycle commuting increases. The Department for Regional Development (DRD) say they have spent millions on Belfast cycling, but they are not providing a cycle network – they’ve created a network of parking lanes. This is against a backdrop of cycling casualties continuing to rise, which bucks the trend of safer roads in Northern Ireland. Pressure must be brought on DRD and Minister Danny Kennedy to stop ignoring the problems which hold down sustainable transport in Belfast . Lack of DRD enforcement is putting some of the most vulnerable road users in harm’s way every day. Our piecemeal cycle network lies useless, while at the same time DRD plans to flood Belfast’s bus lanes with over 2,000 taxis. DRD only pay lip service to sustainable transport. Belfast cyclists are determined to change this. Let your MPs, MLAs, Councillors, DRD and Roads Service know how your cycling journey is made more dangerous by illegal parking. Only through concerted action can we hope to see real change. DRD determined to halt Belfast cycling progress? Apologies to the rest of NI for another Belfast-centric post, but the vast majority of bus lanes are situated in the greater Belfast area, and one fifth of taxis currently operate here, which could rise under the new licensing regime. How much will this damage cycling uptake? Belfast has an ‘aspiration’ to raise the level of cycling in the city to 10% modal share by 2020. Not an official target mind you, which might bind a government department to actually delivering it. This why we fail – we still have one of the lowest modal shares in the whole of Europe. In the decade to 2011 there has been 60% rise in the number of Belfast commuter cyclists – that’s a 2.1% modal share and almost 2,300 regular cycling commuters. 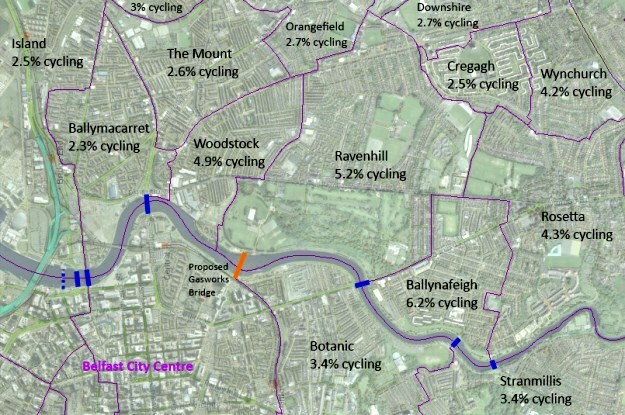 Some areas of south Belfast are already upwards of 5% modal share. We need to add over 8,000 more cyclists to Belfast rush hour to get to 10% share. This kind of massive surge hasn’t happened to date, so why would busier, more intimidating bus lanes make it more likely to happen? And what do we lose by denying taxis the use of bus lanes? 24% less people travel to work by taxi than in 2001, down to just over 3,000 people, or a 2.9% share. If these two trends continue, cycle commuters will reach parity with taxi commuters by 2015, and by the next census, the current levels will be reversed in cycling’s favour. That would be just 3,000 cyclists by the way – if we want a total of 10,000 cyclists on our rush hour bus lanes by 2020, why threaten that aspiration for the sake of dwindling numbers of taxi users? Madness. Why are people in Belfast dissuaded from road cycling? In a recent survey of Belfast residents, 60% of people felt roads were too dangerous for cycling. So why is DRD salting the earth for the sake of a declining taxi commuting sector? Why has DRD not listened to objections? 86% of the rubber stamp exercise consultation responses were negative, yet how did DRD choose to handle this? With a real slap in the face to those who responded with the ‘wrong’ view – lumping everyone together with one phrase, “mostly from cyclists“, and dismissing all fears as unfounded. I’m guessing there’s a warped logic at work – if you can distill 60 objections in to one incorrect opinion, and weigh that against fully 7 (seven) responses welcoming the proposed changes, then we have a majority in favour! That’s how government works! The logic doesn’t work both ways though – just ignore the fact that the 7 (seven) positive responses were mainly from private taxi hire firms. Shhh! Given the overwhelming negative view on the issue, how will DRD address cyclists’ safety concerns? See if you can hear it.. Audio sourced from the Northern Ireland Assembly – subject to Parliamentary copyright. If you sent an objection in to DRD, why not follow it up with a complaint that your objection has been effectively disregarded? Northern Ireland taxis are now…sustainable? Really?! In a public policy exercise as intellectually bankrupt and dishonest as taxis in bus lanes, this marks a new low. All those saloon cars driving around with 1-2 passengers are perfectly sustainable, as long as they are designated so by government. DRD should pass this trick on to the Department for Finance and Personnel. Northern Ireland can dump Air Passenger Duty for short haul flights too by simply designating all aircraft as ‘sustainable’. I think Sammy Wilson might actually be game enough to try it..
Why damage journey times for 13.5% of commuters, for the sake of 2.9% of commuters? There are no government targets to increase taxi usage – why would there be? Yet this entire policy seems entirely designed for that one purpose. Meanwhile, by the hard numbers from Census 2011 again, 13.5% of people use buses to get to work. In terms of sustainable objectives, reducing rush hour traffic and increasing revenue take for Translink, more bus passengers is a big goal for Belfast. Just 2.9% of people used a taxi as their main form of transport to work in 2011, down from 4% in 2001. Metro and Bus Rapid Transit efficiency of service will be one of the big factors which determine success of public transport in Belfast. The consultation itself recognised that taxis in bus lanes would have a negative impact on buses. A report from Amey in 2008 stated “bus lanes are currently underperforming against targets…additional vehicles in the bus lane … would probably contribute to further reduced bus journey speeds”. How destructive can one little policy be?! What is really driving this policy? Taxi firms must have some truly amazing lobbying powers. Northern Ireland’s wonderfully transparent political system doesn’t allow us the luxury of seeing donations to political parties. So we’re left to wonder why such a poorly designed policy is being railroaded through a hostile consultation exercise, and if the policy wonks have given any weight to the potential damage it could cause? Is Minister Kennedy running the risk of fatally undermining both Belfast Rapid Transit and the city’s blossoming cycling potential? Two birds, one stone – well it’s more efficient than a Belfast bus lane. @nigreenways @edsimpsonni If taxis are allowed into bus lanes by DRD I will have to retreat to the pavement. Too many run-ins. @nigreenways @stripymoggie Agree entirely that DRD screwing this up. @nigreenways great article! it’s really shocking. I think a ‘boilerplate’ email template here would help more people get their responses in. @nigreenways I’m still scared on the road at anytime! Wld prefer separate bike lanes! @nigreenways Confession time… I have a taxi licence, which shows they’ll give one to anybody. Self employed taxi men in bus lanes is mad! Letting taxis into bus-lanes will so obviously kill cyclists it is verging on premeditated murder. I think if taxis are allowed in the bus lanes, every time you have a run in with one, you should report it to the PSNI and DOE. @nigreenways absolutely disgusted by this decision… Thanks for highlighting. Great article, I will write to complain. If DRD allow taxis in bus lanes it will be a ludicrous decision, making a mockery of consultation and clearly satisfying a vested interest. @stevenagnew So bus lanes are now just speedways for the McCausland’s? Do they have more votes than me at the ballot box? Or are we USA’d?